Getting a job working at the Stewart House Hotel is the answer to Tessa Johnston’s prayers. She’s from a medical family back in Annapolis, Maryland but she has big dreams of doing something different with her life. Devoted to service work, she finds the hotel is a perfect match for her interests and personality, though the shifts in the diner make her nervous. The overfull trains lead to more people coming in for breakfast and Tessa begins to lose her nerve. Her friend Wendy inspires her to start looking for a prospective husband in the newspaper advertisements. She begins writing to Samuel Grayson, a handsome rancher who’s been burned by a girl from the Stewart House before but is willing to give it one more try. When Tessa and Samuel meet in person, it’s practically love at first sight. Will her service background mesh well with his desire for a housewife? Tessa is willing to take a chance if he will. 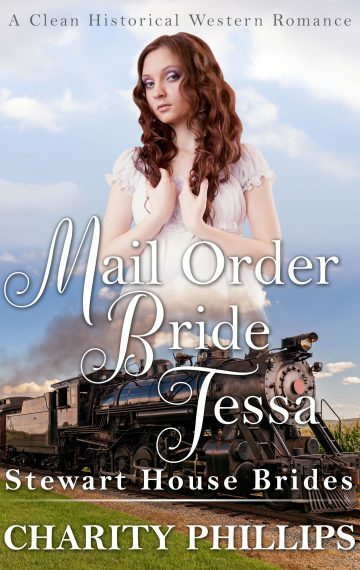 Mail Order Bride Tessa is a standalone 20,000 word clean historical Western romance.